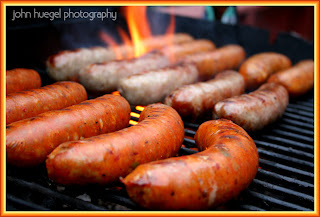 Last week we grilled sausages for the 6 of us for dinner. I had a nice selection of Hot Italian, Bratwurst and Chorizo. It looked so tasty on the grill that I had to grab my casual camera (a Canon DRebel with a kit lens) and shoot a few frames. I like how the flames are shooting through the back and the glow of the flames below shows through. And I like the close focus on the nearest links. The meal was wonderful, and we had a few to last us into the next week. This entry was posted in food, sausage by admin. Bookmark the permalink.